We’ve heard it said a thousand times, but the old adage remains true. Last night, Certified Journeyman Farrier Rodney King of Rood & Riddle Equine Hospital gave a talk at Alltech’s monthly News & Brews meeting. The meetings feature an expert speaker from the equine community along with refreshments and Alltech’s Kentucky Ale. 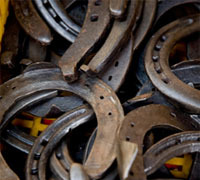 Detailed slides showed lightweight aluminum racing plates, which have to be replaced every three weeks due to the pounding of morning gallops; the smooth, wide hind shoes worn by reiners, called “sliders”; and the drilled steel shoes equipped to handle dozens of interchangeable studs for traction used by eventers. Dressage horses need wider shoes to “float” over the top of their footing, whereas endurance horses need a light-weight shoe tacked on the morning of their long ride in order for it to hold up. It was interesting to learn how minimally hoof trimming varies between different types of horses, versus how much the shoes attached to those feet vary. King also advocated leaving a horse barefoot if his feet are robust and healthy, and don’t wear down faster than they grow. All in all, the night was a good reminder to have a skilled farrier keep up with your horse’s regular trims so he’ll remain as sound as possible. We have been through many farriers. we finally started using my trainers last summer he is great! It’s hard to find a good farrier that decently priced… sometimes you have to go with the bottom of the barrel… yikes..